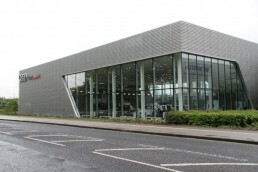 Based in the heart of Yorkshire, the new York Audi showroom is located just north of York city centre and can be easily reached from the A1. Works started on site in June 2013 and were completed by the following month. The steel structure created a new 17 car showroom utilising a trussed frame to optimise the large open plan area, the new workshop included a car deck above, offering a smart storage facility for new and used vehicles.